First line: Almost a year has passes since we overthrew the wicked tyrant, Queen Levana, and crowned my best friend, Cinder—AKA Princess Selene Blackburn—as the true queen of Luna. Summary: In the second installment of the Wires and Nerve graphic novels by Marissa Meyer we see Iko and Steele continue to hunt the blood thirsty genetically altered soldiers of Queen Levana. The soldiers have refused to return to Luna and accept that the war is over. With the planned trip to Earth, Cinder and her friends are worried about being attacked while celebrating the new peace treaty between the two nations. It is up to Iko and Steele to prevent this from happening. Highlights: I loved the Lunar Chronicles. The fairytales intermixed with science fiction/fantasy were fun and exciting. 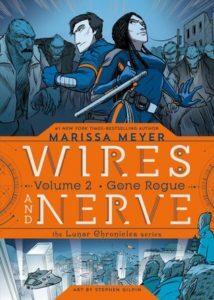 I was happy to see that Meyer was going to continue and expand her universe with the Wires and Nerve stories. I am not much of a graphic novel reader but these were fun. The drawings were simple and monotone but still fit perfectly into the Lunar universe. Lowlights: With graphic novels, the stories are usually short and very basic. I wanted more. I wanted to see more of my favorite characters. This is why I cannot read too many graphic novels. I like a fuller story. FYI: Second in the series. However, you need to read the Lunar Chronicles before reading these! I am a senior library assistant. I am in charge of creating adult book displays that showcase many different books from our library collection. Being able to work around books is a dream! I read anything but my favorite genres are historical fiction and YA. Give me anything set in Tudor England or teenage fantasy novel and I am set.